I would often grimace when the brushes I put outside my vanity table's drawers get a film of dust over them- especially when I just washed them. I'm so allergic to dust that it causes me to break out in hives and makes my nose runny. I try to minimize my exposure by damp dusting and securing some of my brushes inside drawers encased in their brush guards and by washing them regularly. However, keeping them inside the vanity's drawers cocooned in their guards makes it extra hard to find them and to tell them apart. I have a favorite pencil brush that I use to smoke out my liner and it takes a few tries because the brush guard's mesh obscures the brush head's appearance. I decided to look for containers online so I can finally put them on top of the table and immediately see and use the brushes I need without having to worry about them getting dusty. Some sold the dust free acrylic brush holders for 50 dollars per case and some for 26 but the cheaper ones were out of stock so I decided to go down the DIY path for my predicament. 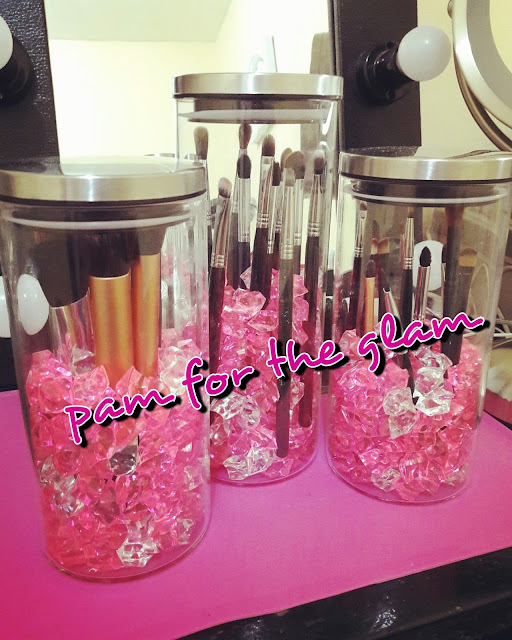 I got three generic candy/pasta jars and put in some acrylic crystal fillers and voìla--- Instant brush holders that keep dust away. Each jar costs about 5 dollars each and the crystals around 2 dollars. I spent 26 dollars for all three jars including the crystals. You can find candy/pasta jars at any store selling kitchen stuff and the crystals at any place selling home decor. You can also use grain, marbles, and stones. I just really liked how the crystals look so much like pink and clear ice. I simply washed the jars and the crystals with dish soap, dried them and added my brushes. They look way better than the acrylic ones I was planning to buy and they blend seemlessly in my vanity setup. I would recommend this over the acrylic organizers available because they look better and they are a lot cheaper than the acrylic ones. So if you want to save some cash or just feel like being creative, give this DIY project a try. May the glam be with you!